Rollomatic liner. 8 wrap coils, wound in house by Luckys MFG with precision on pure iron cores by Lucky Supply. 1 1/4" in length. Blackened frame and all hardware is brass, iron or blackened except for the copper contact screw. Stamping on the frame may vary. Fad and fancy come and go, but legend and legacy are forever. 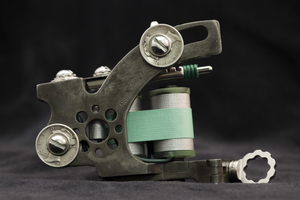 With the tragic loss of Mike Malone, we were all on the verge of losing the legacy of his monumental tattoo machine building knowledge, ability and tradition. Not only his long standing, signature "Rollomatic" machine, but also, the rights that he held to the genuine "Bulldog" machines. 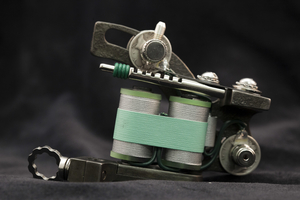 Fortunately for all of tattooing, Keith Underwood was taught all of the tricks and tips in Malone's machine building arsenal, so the legacy continued. 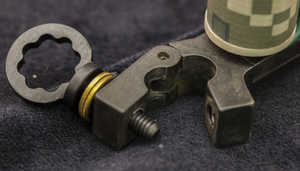 Keith was bequeathed the outright rights to both the "Rollomatic" and the "Bulldog," but keeping up with demand for tattoo machines has become secondary to being a family man, so he has decided to pass the entire package on to someone who will truly nurture and preserve the integrity of the line. All of the machine building knowledge, tricks and techniques of Malone are still headed down the same path of legend, in new hands. Jimmy Whitlock of Lucky Supply is now the sole custodian of the rights and the practical building knowledge of the Sailor Jerry Bulldog and the Mike Malone Rollomatic Tattoo Machinery Lineage. He will do whatever it takes to honor the tradition of these great men and machines by continuing to make rollomatics and bulldogs with the same look, feel and function of the time-honored, genuine article. Make no mistake about it...when you buy a "Mike Malone Rollomatic" or a "Bulldog" from Lucky Supply, you are buying a piece of tattoo history.